This probably can't be avoided given the difficult task set in front of mainly former players and not informed broadcast professionals (I see you Dan Shulman). I grant all of this because what bothers me most about baseball broadcasts is not the occasional dumb observation, but the remarkable lack of knowledge that some broadcasters have about the very game they are employed to cover. Being a fan of the Toronto Blue Jays, you may already have a sense of where I’m going with this. 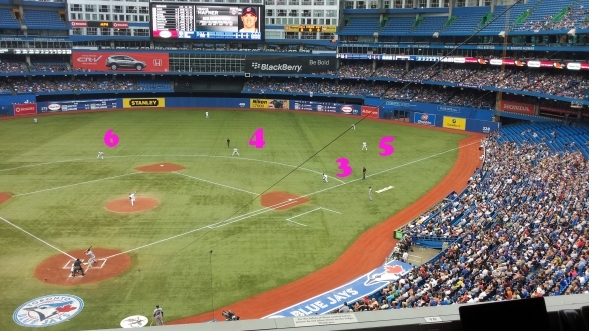 Pat Tabler is a man who sits next to Buck Martinez most nights and talks about baseball. That is his occupation. He is paid to provide insight to the broadcast in moments when Martinez is ordering another drink not describing action on the field of play. For the most part, “Tabby” is an affable, sympathetic character who carries the authority of a man who was himself an MLB player. From time to time this perspective of a life spent in baseball provides insight into what it is like for a player in a given situation. His eleven-year MLB career was littered with some ok seasons and six seasons below replacement level, including four consecutive negative WAR seasons to close out his career. Sometimes I just can’t help but feel like we are witnessing the ’89-’92 of Pat Tabler's broadcasting career given how his analysis trends towards the head-scratching and perplexing. 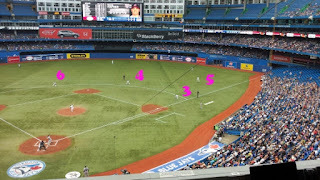 During the broadcast of the Blue Jays’ final Spring Training game on Saturday April 1st, Tabler’s partner Buck Martinez described for the 10,000th time the ways in which teams are now utilizing defensive shifts. Anyone who has watched baseball since the propagation of the internet understands how the collection of data has changed the way that teams approach defense. Tabler himself related a conversation with a member of the Pittsburgh Pirates coaching staff who detailed a simple to understand tidbit. Not only do the Pirates employ data to inform their defensive alignment, but they also base their pitch type and location decisions on where the defense is positioned. The broad point was that if a defense is shifted towards first base, the pitcher should locate a pitch on the first base side of the plate, which leads to a greater possibility of a batted ball finding its way to the properly configured defense. In Tabler’s own words: “That blew my mind”. The fact that this blew Tabler’s mind, blows my mind. Shift the defenders to a spot where a batter is most statistically likely to hit a ball. Throw the pitch to the spot where the batter is most statistically likely to hit the ball to where your defense is positioned. Tabler’s throw away comment about the Pirates’ approach was quickly forgotten in a rambling conversation that He and Martinez would carry for the rest of the inning. I couldn’t let it go. Again, I have to reiterate that Pat Tabler is employed to talk about baseball. His sole duty is to be informed enough about baseball that he can sporadically converse with another individual to provide context to the game as it unfolds. While his life experience playing the game most certainly provides him with an intuitive understanding of the conventions of baseball tactics, I’m baffled as to how he could live to 59 years old and not understand one of the most fundamental aspects of defense in modern baseball. Am I making too big a deal about this? I’m writing to you good people because frankly, my wife has begged me to stop complaining about Pat Tabler. She tapped out after a mere one-and-a-half hours of my chronicling all the mundane, clearly-obvious things I could conceive of that “blew my mind”. “Raisins are just dried grapes. That blew my mind”. It went on like this and it was exactly as painful as you are imagining. That should be more than enough Tabby. Stay in your lane and please leave the baseball to the professionals.